Interest earned on these bonds is non-taxable. Bonds having credit rating AA and AAA are likely to meet their financial commitments. Returns on these bonds are beneficially only after lock-in-period because the returns are guaranteed at maturity. If sold before lock-in-period ends, then you may get an amount higher or lower than the initial amount investment. It is an equity-oriented mutual fund in which the returns are tax free as per Section 80C of Income Tax Act, 1961. Since the gains are earned through equity investments, they may be relatively higher than the Fixed Deposits and Debt-Oriented Savings Instruments. Investors must be well aware of its past performance and befine with taking a moderate amount of risk while investing. Introduced to encourage first time investors into adopting the equity culture. Maximum Investment amount is Rs.50000/- and 50% of the investment can be used for tax benefits under Section 80CCG. Returns are market based with a moderate to high amount of risk. A smaller investment amount and a lesser lock-in-period definitely makes the RGESS a more appealing option if you are investing in equity savings scheme for the first time. NSCs are savings certificate issued by post office. 5 Year and 10 Year lock-in-periods offer guaranteed returns at maturity. Interests earned are taxable as per individual’s Income Tax Slab. Traditional yet highly preferred retirement planning instrument. Great Long Term Saving Investment providing an interest of 8.7% annually for the year 2013-2014 term. Maximum Investment Rs.100000 per annum. Additional benefits include the option of taking loans from the start of third year to the end of the 5th year as well as withdrawals from the sixth year onwards. Accumulated amount plus the interest received on maturity is no-taxable. Under Section 80C, fixed deposits with the bank for a lock-in-period of not less than 5 years is exempted from tax. Applicable with Rs.100000 limit which includes life insurance and provident funds. Gives assured returns on maturity. Risk cover to protect your family in case of untimely events. 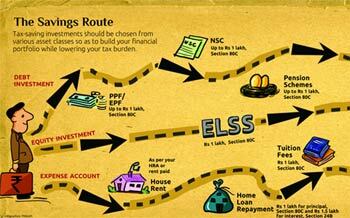 Tax benefit under Section 80C for the premium paid for the policy. Additional benefits, once the policy term finishes. Under Section 10(10D), if premium paid per year for the policy is less than 10% of the sum assured, then the amount received on maturity is exemption from tax deduction. Benefit under Section 80D upto Rs.15000 on policies for yourself, spouse and children. And if you are paying health insurance premium for your parents as well, then you can get an additional benefit of Rs.15000 taking total benefit of Rs.30000. These benefits are subject to couple of conditions, you must be less than 65 years of age and policy premium must be paid through cheque or credit card and not cash.